A special thanks to everyone. The event sent a wave of love like a cosmic hug, far and wide of magic, love, and harmony. A very special thanks to Tim McHenry and Fay at The Rubin. Jason, Riva, Jesse, Aaron, Erik. David Lynch and everyone at DLF for such grace.Thanks to David Spero for well- triage! and Howie Edelson and everyone at Sirius for shouting the good word far and wide. Neil Jason at Guitar Center for letting us walk out with a very expensive Martin guitar on loan- gratis! George Lois, Lucas, Matthew for a focused lens, and Dallas Thayer for lots of instrument lugging, copy, pasting expertise. 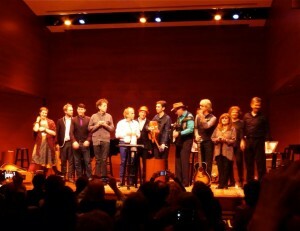 And of course- the magicians who performed sacred magic onstage- Royston Langdon, Sam Kogon, Professor Louie, Dusty Wright, Richard Barone, Mary Ann Jardine, Phil Ligori, Maria and David Silliman, Lisa Apatini, Paul Shaffer, Blondie Chaplin, and our guiding north star of melody, harmony and love- Al Jardine. We had fun fun fun and God only knows, many folks will be happy when we Do It Again, some day soon. ©2014 by Lisa Apatini | All Rights Reserved | Web Design - J. Apatini |.